We filmed a short video for this recipe. You can view it below. For more videos, please subscribe to my YouTube channel. 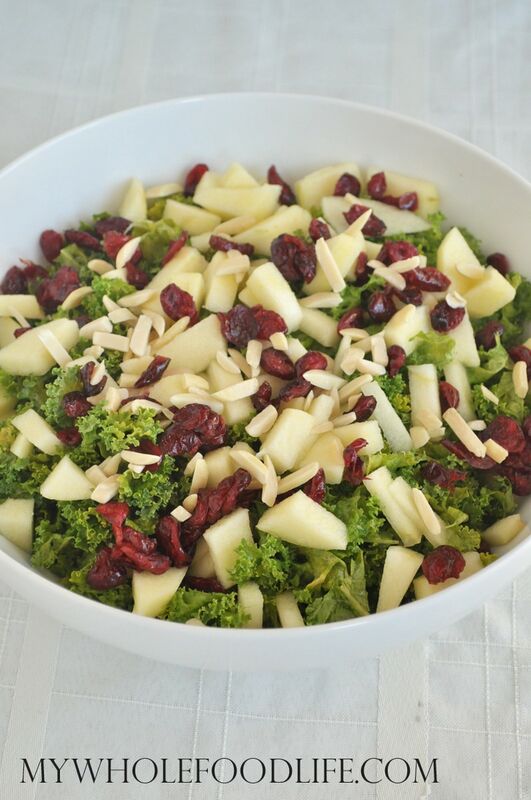 Remove the stems from the kale and chop into bite sized pieces. 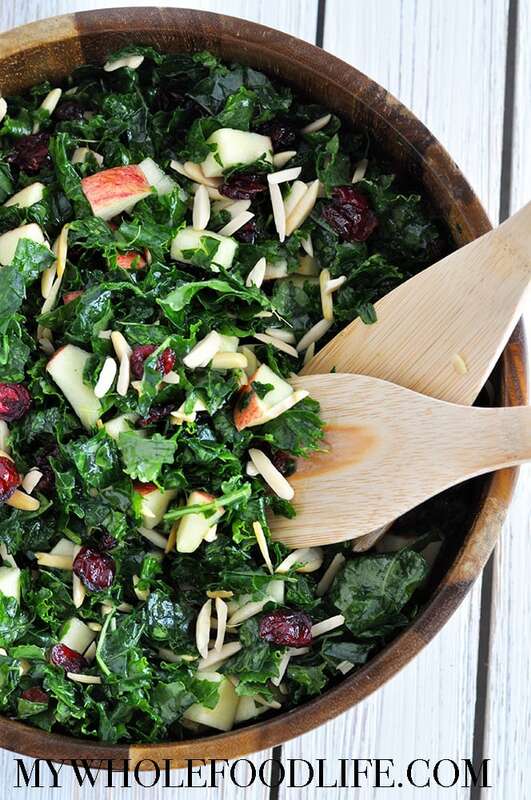 Using your hands, massage the kale. See video above. In a large serving bowl , add all the salad ingredients. In a small bowl , whisk together the dressing ingredients. Serve immediately or wait 30 minutes for the flavors to develop more in the fridge. This should last 4-5 days in the fridge. Enjoy! Yay! Getting it, thank you!! Thank you for showing how to do this. The reason I didn't put kale in a salad was because of the toughness! Thanks again, very helpful. If this is the kind of thing that they serve at Whole Foods- then please recreate more of their menu. I don't have the time or money to take the 5hour long train journey - but this looks yummy!!!!!! 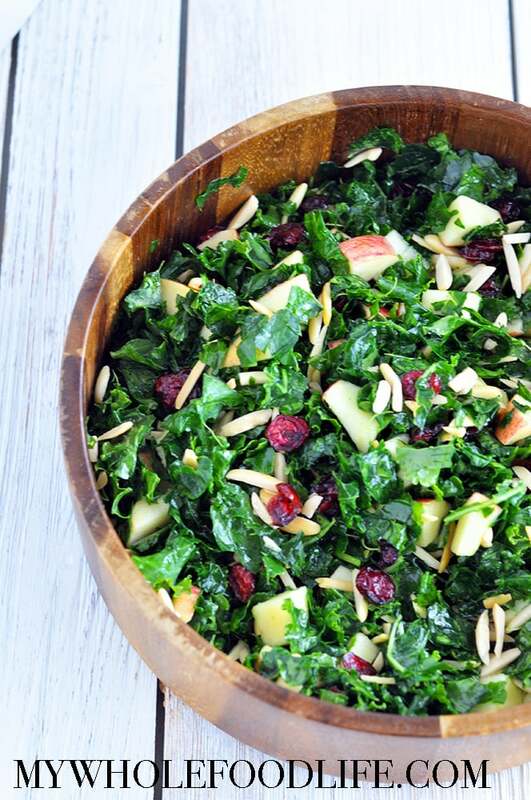 Apples, kale and citrus go so well together. Have you tried this dressing with fresh lime juice? I think you'd love it as much as the lemon. Sweet video, and congratulations on your first! I've only ever massaged kale with ingredients such as avocado or lemon or lime juice. Next time I make a salad, I'll try massaging it plain--no mess! But we do like playing with our food at our house, so massaging with goodies is fun too. Gorgeous photos, btw. You're welcome. Just stopped back by to let you know I'm sharing this as my pick for #Recipe of the Day on social media today, including Twitter and my own YayYay's Kitchen Facebook page. So good! Just made this last night - the dressing is delish with Meyer lemons; they're so sweet that I only used 1 T. maple syrup, and I think I could have used less. I didn't peel the apples. Will be making this often - thanks! I made this salad for dinner tonight i Added a little red onion, my daughter who hates salad said it was great. Do you have a “how to massage kale” video? I’d love to learn. I need to try this salad! It looks amazing!